When I thought of giving our kitchen a whole new look, I tried using beadboard paneling, and after a couple of years I am still glad that I did it. I did not stop at the kitchen, whenever I can come up with the budget, I would apply beadboard wainscoting to different rooms in our house; and when I run out of rooms, I will install wainscoting around the outside of our house. 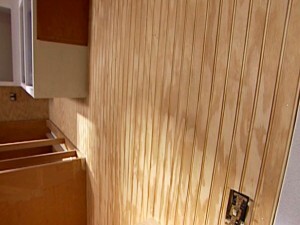 That just serves as a testament to the versatility and everlasting style of the classic bead board paneling. If you are also interested in using bead boards, but you wish to learn more, then this article is perfect for you. Why Are They Called Beadboard Paneling? The beadboard was first used back in the late 1700’s, when leftover tongue and groove planks from making the floors were used to protect the fragile plaster walls, especially in the rooms were there are a lot of activity, like the kitchen. Each plank were painstakingly cut to length, and then nailed one by one, to produce a raised panel on the wall with a grooved or beaded texture; hence the term beadboard. Nowadays, you can buy these types of paneling in 4 x 8 boards that are already beaded, and the perfect height for a wainscoting, the only thing you have to do is install them. How Should Beadboards Look Like? There is technically no restriction as to what kind of finished look you can put on beadboard wainscoting. If you want to achieve the classic, Southern farmhouse look and feel, paint it plain white. If you want to give it a touch of class and elegance, you can try staining the wood to match the other pieces of furniture that you have. There are no set standards on how a beadboard panel should look like, you can even paint it different colors if you want to; your only limitation is your imagination. Where To Buy Beadboard Paneling? You can try looking at your local lumberyard for your beadboard needs, if you are lucky and they have some in stock, you will find that they cost less than when you buy them from home improvement stores. If there are no lumberyards near where you are, then the only other place you can get them is in the home improvement stores, you can be sure that they will have a lot of beadboard wainscoting choices there, like if you want to save on money from paint, you buy the beadboard wainscoting already painted, saving you from all the trouble of finishing it yourself. If you are looking for an easy DIY project that you and your family can do this weekend, then you should consider installing a beadboard wainscoting in one room of your home. You can never discount just how much improvement simple enhancement like a wainscoting can do. So if you want to protect your plaster walls from getting damaged, and also to improve the look and add a bit of charm to the room, use beadboard paneling.